EQ2Interface : Fetish Nightfall FULL patch for LU# 21 and 22. : Fetish Nightfall FULL patch for LU# 21 and 22. Category: Patches & AddonsFetish Nightfall FULL patch for LU# 21 and 22. Name: Fetish Nightfall FULL patch for LU# 21 and 22. - Fixed the missing Persona stat bar. 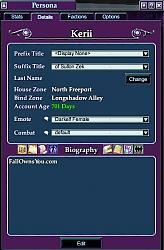 - Fixed missing factions page. - Fixed mis-allignment with the Zone Reuse timer window. 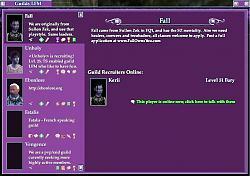 - Added the hotfix button to the guild recruitment page; in the guild roster. (Thanks for the info Branaddar2). If anyone finds anymore errors or issues with this patch, pls let me know. This patch will bring Fetish Nightfall completely up to date with LU # 21 and 22. There is some slight mis-allignment with the tab in the guild manager with the new tab, so you will need to click slightly below the tab. I've been using this myself for the last day or so, and there seem to be no issues with any of the new windows or buttons. - PvP checkbox for the examine window. 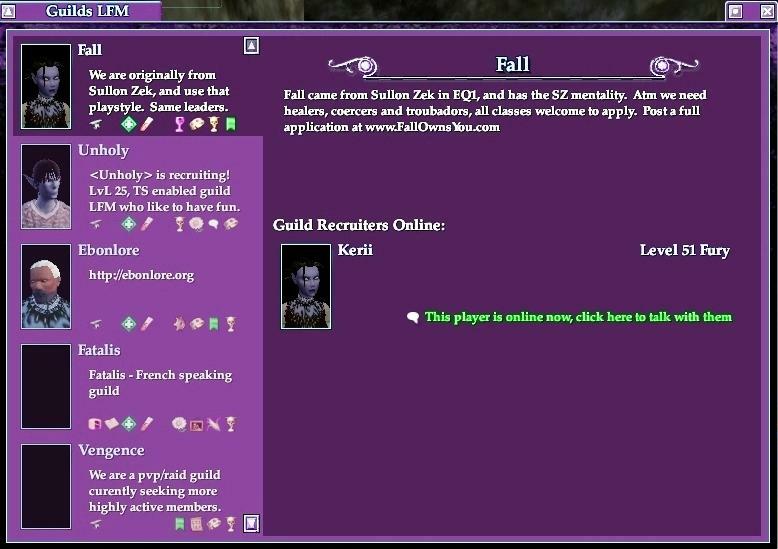 - The new Recruitment Manager tab in the Guild Manager. 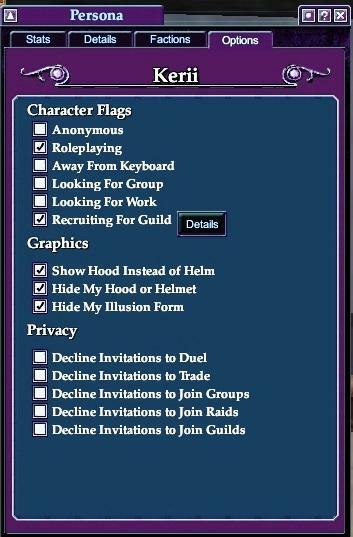 - The new Guild Browser window. - The Reset button for the AA abilities. 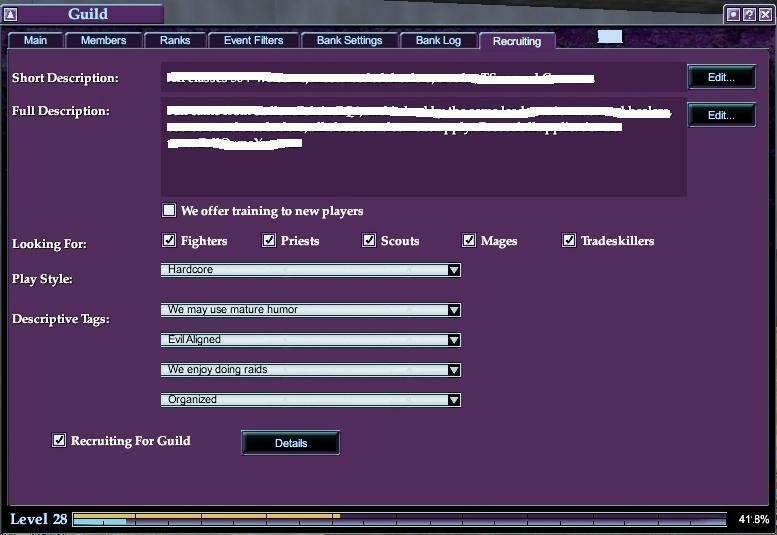 - The Toggle button in the Skills window for Guild Recruiter. You MUST have Fetish Nightfall V6.3 by ZONX prior to using this patch. To use this, Download it and drop the unzipped files into your Fetish folder, clicking YES to replace the existing files. Check to make sure you hav ethe file named "eq2ui_mainhud_persona" If you don't have that file, nothing will open when you click the button in the Persona window. Let me know pls, if this is still an issue I'll be happy to re-upload this with the stat bar in place. Which window are you talking about here? Quick question.. did you ever fix that create character bug? great UI by the way .. i wouldn't play without it! 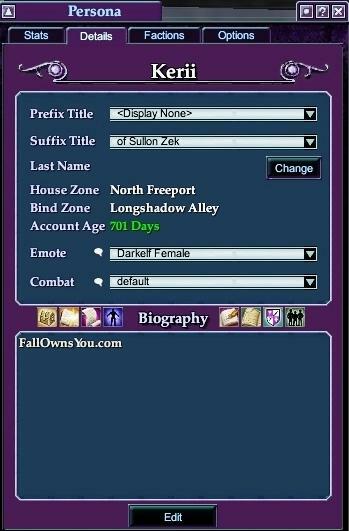 Another fix I'd suggest is a quick-fix Sony added in for their guild recruitment window. 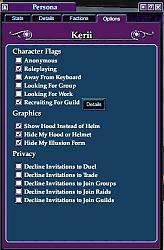 The button that lets you see a list of the guilds recruiting. 3) Replace the entire section from the <Icon... to TreatAsButton="true"/> with the following. The fix is the PackLocationProp line. Otherwise the icon was trying to show a null picture, so it wasn't clickable. Oops sorry about that, I took that out of my version, and forgot to add it in for this patch. find the file named "eq2ui_mainhud_persona"
The line under it will be for the Minimise button. Save and close the file and you have your Persona button back. Last edited by Savie : 04-19-2006 at 06:16 PM. Either im not putting the line in the right spot or something else is wrong, parsona stat bar still nto working. when i added the code the button showed but wouldnt open the stat bar. Am i the only one that uses this stat bar? Last edited by Savie : 04-19-2006 at 10:44 AM. One query tho - I can't seem to see the button to bring up the persona stats bar any more? Used to be a little button on the Persona window..... Doesn't seem to be there with this patch?